I’m writing this from the Murchison Radio-astronomy Observatory again. Yep, I’ve managed to get myself back up here! This time I’m travelling as part of the grand prize that ICRAR awarded to the top member of theSkyNet as part of our first anniversary celebration. We celebrated a year of achievements on September 13th – it’s almost hard to believe how much we’ve managed to get done in only twelve months. 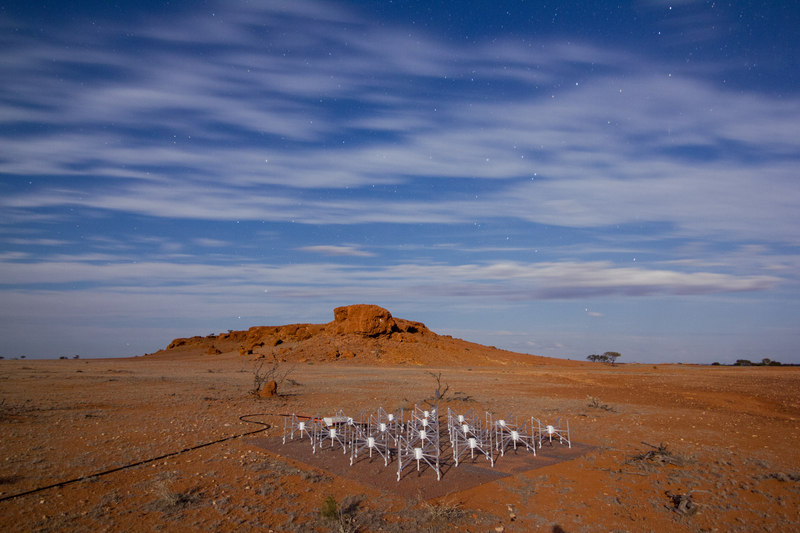 Since the beginning of theSkyNet we’d been promising a trip to the Murchison to see the Australian SKA Pathfinder (ASKAP) and the Murchison Widefield Array (MWA) as the grand prize. Our anniversary seemed like a good time to award it, and we were excited to take our winner – Kim Hawtin or vk5fj – up to the desert to see everything that’s been going on up there. I was also not-so-secretly excited to be making my third trip to the MRO and to see the progress that has been made on the MWA and ASKAP since I was last there. We set off from Perth bright and early yesterday morning, ready for the 8.5 hour car trip. 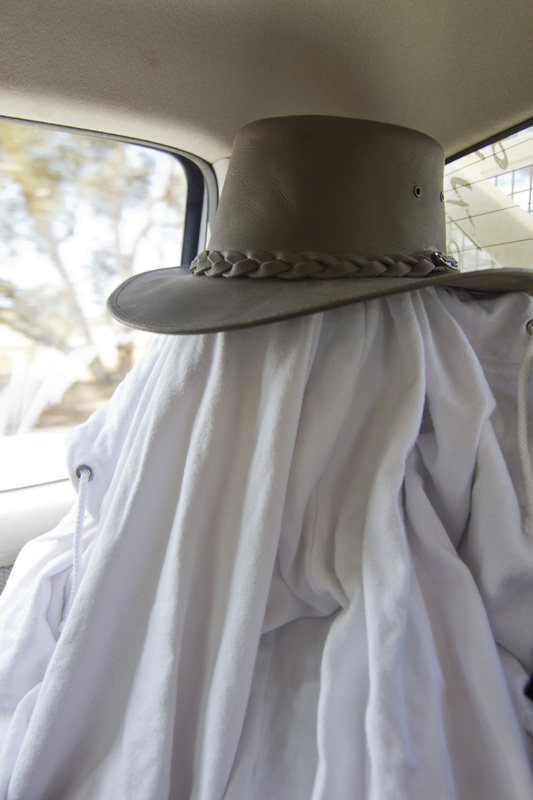 Perhaps ready isn’t the right word, but there was definitely a good feeling in the car as we headed off on the trip. 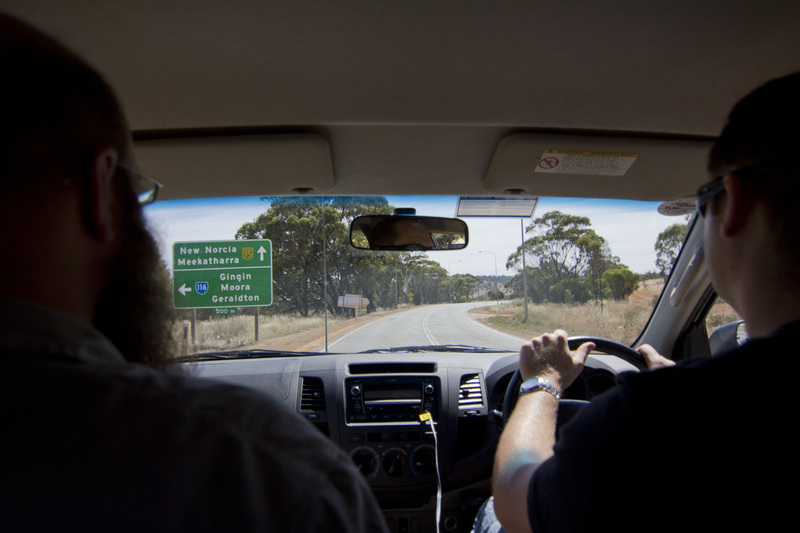 Kim and Pete, up front as we head out of Perth. We also brought theSkyNet team member and astronomer Tim Young along for the ride too. Conversation obviously centred on theSkyNet for the first little while, but started to branch off by the time we reached the outskirts of Perth. The trip up to the MRO is about 600km tarmac and then a further 200km on dirt roads, peppered with small towns and different terrain the whole way. Tim checking our route in the map book, and working out how much longer until we hit the dirt roads. 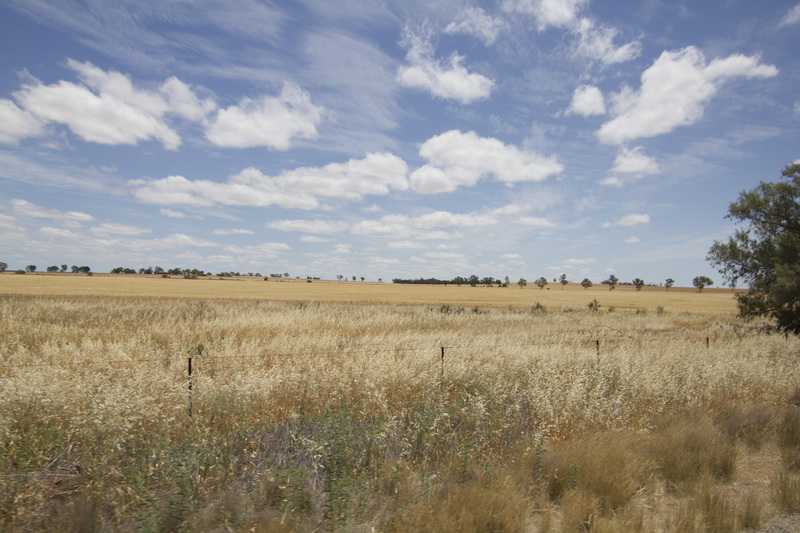 At only about halfway to Boolardy, the terrain changes to rolling fields and blue skies. Lunch break in Morowa, hanging out in front of the visitor’s centre on the main strip. Tim checking through his photos of the trip so far, good entertainment for the long hours stuck in the ute. Many road trains (and real trains) later, we got to the end of the tarmac! 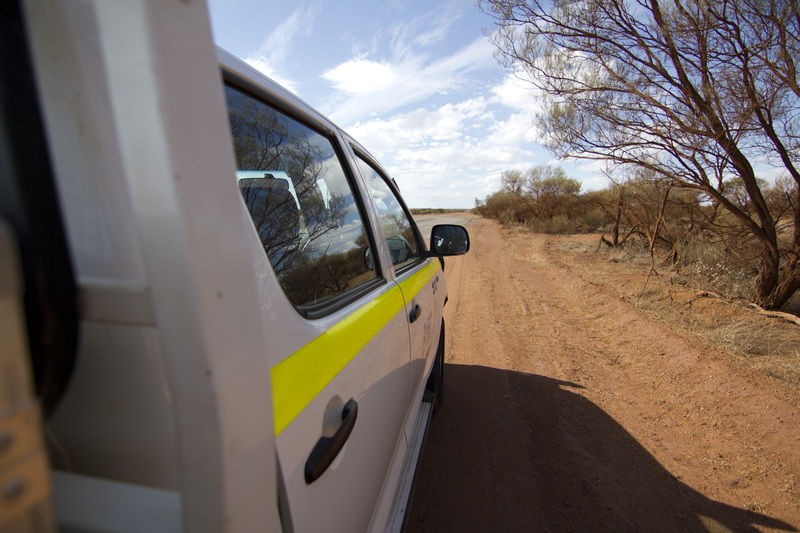 The intersection between tarmac and dirt road, where Pete stops for a break, up in the ute’s tray. We’ve hit the dirt! 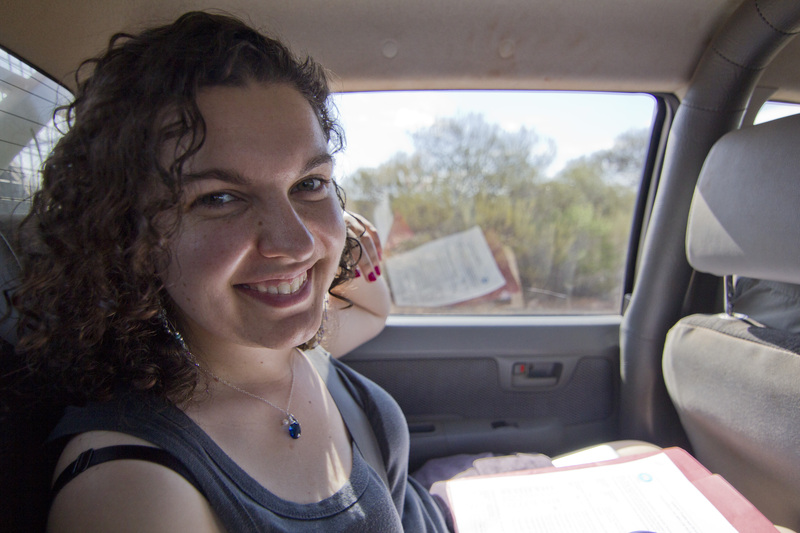 About 200 km to go until we get to Boolardy Station now, all on dirt roads. We then took the windy path from past Mullewa out to Boolardy Station where we spent the night. I look up from the directions to the MRO to a camera lens in my face! Photo: Tim Young. We got in to Boolardy about 5pm, but instead of heading in and getting ready for dinner we ducked straight out to the MRO site to meet MWA engineer Brian and astronomer Martin so we could set up our camera for a timelapse of the night sky over the MWA. The timelapse isn’t quite ready yet, but here’s a little teaser of one of the images for you. Our favourite tile of the MWA, with the breakaway to the South West lit by the full Moon with some faint stars peeking through the clouds. 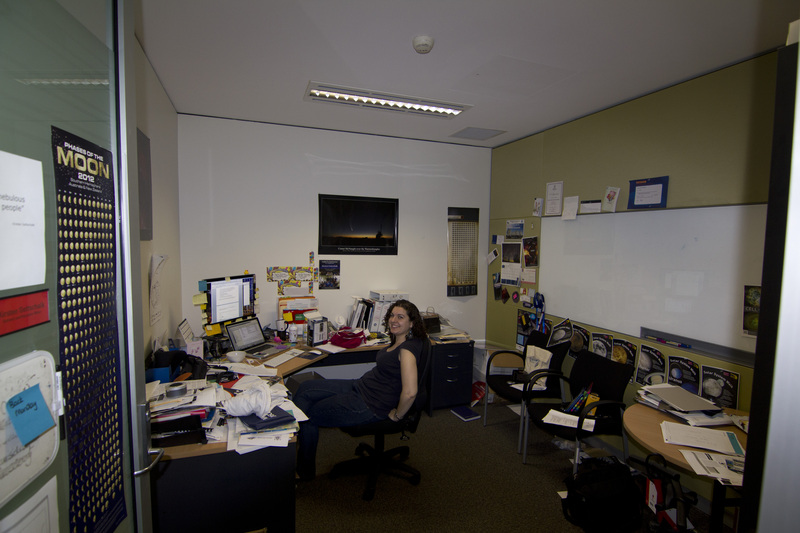 We’re about halfway through a fun filled day at site right now (it included getting to go inside an ASKAP dish!) More on that tomorrow. Hi all, good to see some pictures, and you made it to the station safely. Kim hope your enjoying the trip, also remember to charge your phone and take some picture hihi. And… do you guys happen to have any Amateur Radio gear there and maybe up for QSO on 40m band in the evening? Hi Dale, great to hear from you! Unfortunately no Amateur Radio Gear in a radio quiet zone 🙂 Kim’s been taking a bunch of pictures already, but I’ll pass your message on. 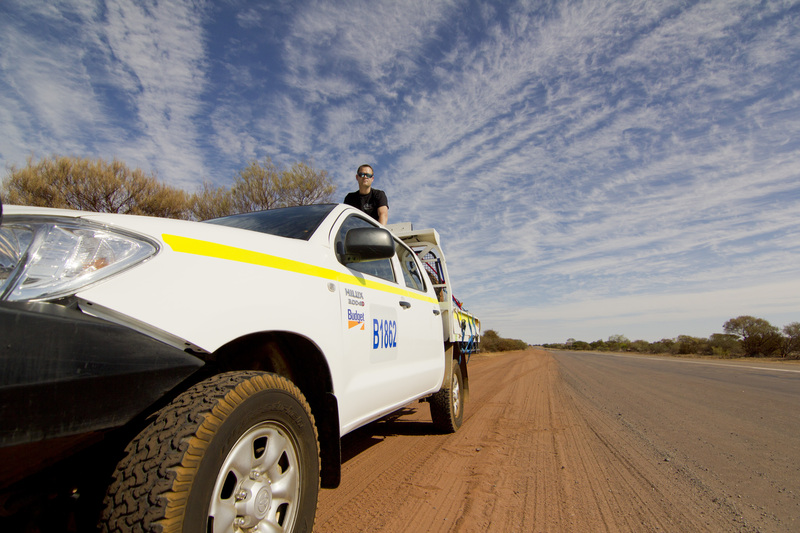 VK5FJ and the start of his fantastic trip to Murchison Radio Astronomy Observatory as part of theSkyNet project. Great to see the reports coming through again Kirsten. Good to see you and Pete at the SKA Board reception at Fraser’s. I and the students and staff of Mount Barker Community College wish you and the crew every success with this current trip. Kirsten, Really glad you looked up from directions. Great picture.